Transfer entire piping systems from most 3D plant design software quickly and easily. our translators are a snap to use. We have estimated that it would have taken two weeks to fully model the large building from scratch in Staad. With the translation program it took about an hour to translate and then about 4 more days to finish modeling. 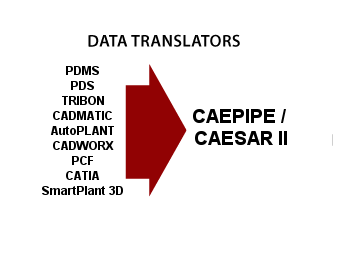 SST offers many effective and verified dataTRANSLATORS whose chief function is to read in the piping model data available in different third-party formats and convert them to CAEPIPE (or other) compatible format. Of course, the major benefit of these translators is immense cost-savings (and time) to the company, because you, as a piping stress analyst, do not have to "re-input" the same data in CAEPIPE (or other), thus saving you a lot of time and effort. This also eliminates errors that may creep in while manually re-inputting the data. Please browse through the different available titles or call +1 408-452-8111 if you do not see your 3D platform listed. You are welcome to read a brief description of capability and download a free 7-day evaluation copy. Be sure to read the Installation Instructions before installing.